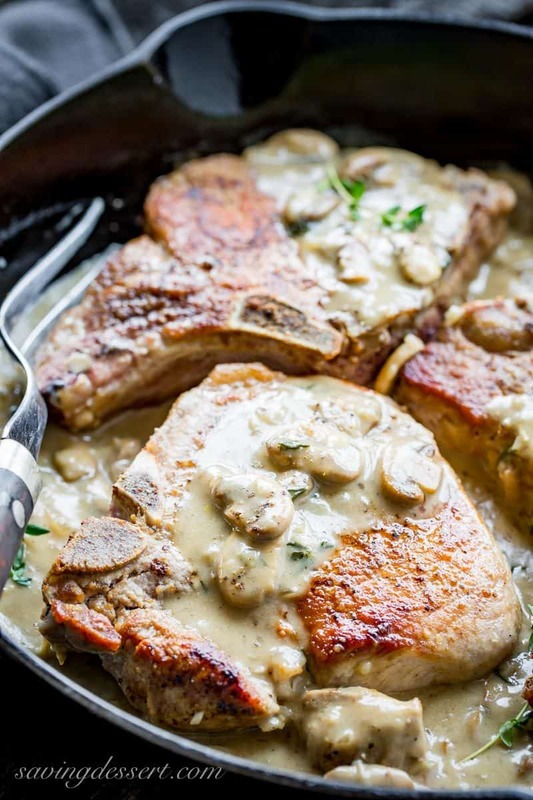 Pan seared, oven baked Pork Chops with Mushroom Wine Pan Sauce – amazing comfort food! 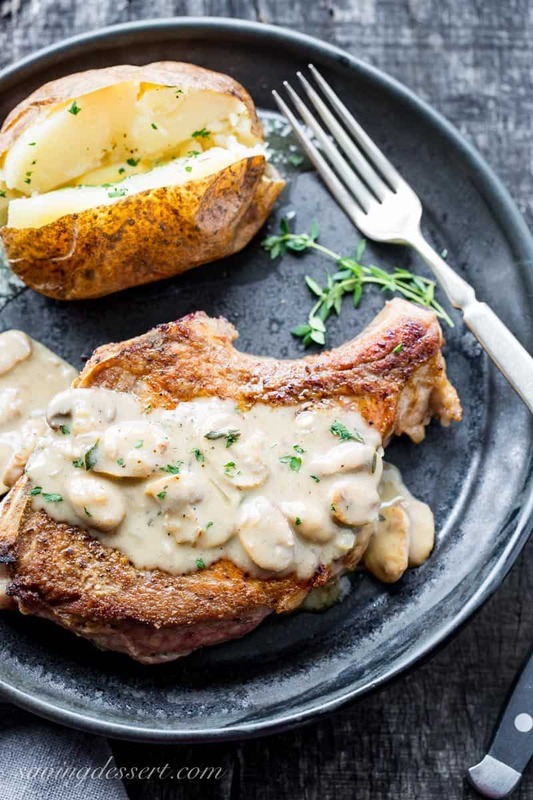 Tender, juicy and deliciously thick, our flavorful chops are a real treat, especially when topped with this thyme infused pan sauce made with garlic, mushrooms, shallots, chicken broth and a nice dry white wine. The sauce comes together in a few minutes, about as long as it takes to finish cooking the pork chops in the oven. You’ll want to have everything prepped, measured and ready to go because once you start, this comes together in a flash. When’s the last time you had a really good pork chop? I know, it seems like forever and a day. So why not change it up with a good thick, well-seasoned, bone-in center cut chop for dinner? These chops are very filling and hearty, and marry perfectly with the pan sauce. It’s not like ‘here’s a pork chop and here’s some gravy‘, they’re absolutely made for each other. 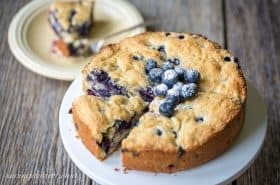 I couldn’t be happier with this recipe! Your hungry family will be thrilled when you fill up the plate with this steak sized meal. Thick bone-in rib or center-cut pork chops were ideal for our pan seared, oven baked chops. The bone keeps the meat moist and prevents it from overcooking. 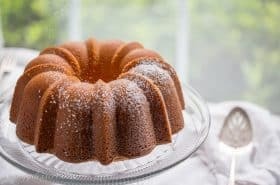 Pan searing in a cast iron skillet seals in the juices, then finishing in the oven on a baking sheet cooks them through. The pan sauce is made in the same skillet used to brown the chops ensuring great flavor. Once the chops are done, any drippings left on the baking sheet are added to the pan sauce at the very end. This quick no-fuss cooking method is an easy way to build big flavor, and our recipe will not disappoint. Don’t skip the fresh thyme, it’s an aromatic perennial herb with plenty of flavor that goes well with mushrooms and wine. 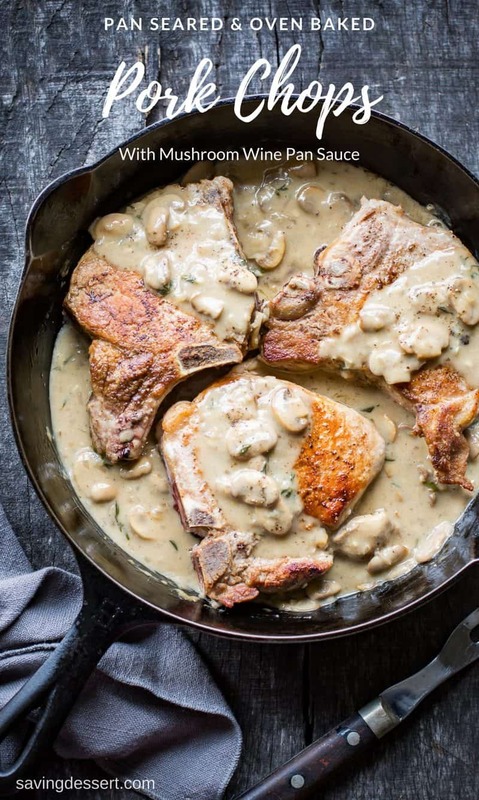 Tender, juicy and deliciously thick, our flavorful chops are a real treat, especially when topped with this thyme infused pan sauce made with garlic, mushrooms, shallots, chicken broth and a nice dry white wine. Dry the pork chops with paper towels and season both sides with Kosher salt and fresh ground black pepper. Heat 1 tablespoon oil in a large cast iron skillet over medium-high heat. When the skillet just starts to smoke, add the pork, two chops at a time, and cook until well browned, about 3-4 minutes on each side. Remove the pork chops to a rimmed baking sheet. Repeat with the remaining 2 pork chops. Bake the pork chops in the preheated 400 degree oven about 6-8 minutes or until you’re able to press your thumb in the center of the chop and feel it spring back. if it’s mushy, it’s not done. You can test the thickest chop with an instant read thermometer if you want to be sure. The interior should reach 140 degrees. They will continue to cook while resting and should reach 145 degrees. Remove from the oven, tent with foil and keep warm. NOTE: Reserve the drippings on the baking sheet to add to the gravy later. While the pork chops are in the oven, make the pan sauce. Pour out the excess oil in the skillet. Add the butter and olive oil to same skillet used to brown the pork and heat on medium-high until the butter is melted. Add the mushrooms and a pinch of salt. Cook over medium-high heat, stirring occasionally, until the mushrooms release their moisture and begin to turn golden, 6 to 8 minutes. Add shallots; cook and stir for 2 minutes. Add the garlic; cook and stir for 30 seconds. Season with salt and pepper. Carefully add the white wine; cook and stir scraping up any browned bits stuck to the bottom of the skillet. Cook until most of the wine is evaporated, about 2 minutes. Reduce the heat to medium and add the chicken broth, thyme leaves, and Dijon mustard. Transfer the chops to a plate and add the juices on the baking sheet to the skillet. Stir in the flour/water mixture and bring to a boil. Cook for about 3-5 minutes or until the sauce is thickened and slightly reduced. Remove from the heat and add the heavy cream if using. Salt and pepper to taste. If desired, return the chops to the skillet. Drizzle the pan sauce over the top and serve immediately. Garnish with fresh thyme and plenty of fresh ground black pepper and enjoy! Take care that you do not overcook the pork. It will be dry and tough. For best results use bone-in chops. They add more flavor and help keep the pork from drying out. Have all ingredients prepped, measured and ready to go. This recipe comes together fast! We don’t eat meat very often these days, so when we do it’s a real treat and I want it to be delicious and satisfying like these Pork Chops with Mushroom Wine Pan Sauce. Another favorite pork recipe is our Grilled Cuban Mojo-Marinated Pork Tenderloin with the leftovers layered into this fantastic Cuban Sandwich. Pork is such a versatile ingredient – it can be a hearty main, rolled into meatballs, served as Breakfast Sausage, added to soups like our Easy Hot & Sour Soup Recipe or stuffed into delicious Japanese Pork Dumplings with Ginger and Green Onion like these from The View from Great Island. 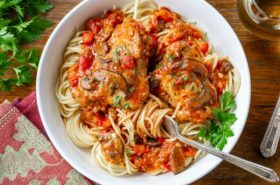 For another deliciously creative way to use pork, check out this mouthwatering Mushroom Marsala Pork Tenderloin from Seasons and Suppers. And let’s not forget the multi-purpose pork roast! Check out these 3 Easy Pulled Pork Dishes from The Pioneer Woman. 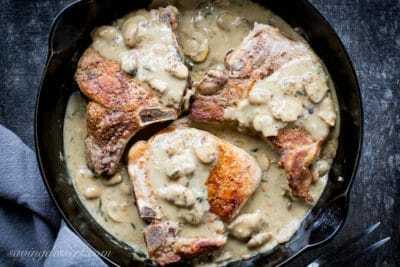 Finally, you’ll want to check out these Smothered Pork Chops from All Day I Dream About Food – what a delicious dinner for any night of the week! You should see how gorgeous your pics are on my big screen:) Having your chicken alfredo penne tonight:) All done..just have to bake..TY for all the recipes! Thank you Monique! I have the biggest Mac they make – and love to look at all your gorgeous photos up close and personal. 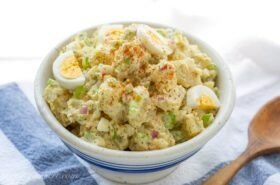 Enjoy the casserole – wish I had some right now! Woo hoo! I would eat these pork chops in a New York minute, Tricia! They look delicious and anything with mushrooms and wine works for me, not to mention the heavy cream. It all would make Bill a very happy man! Thanks for sharing! Haha – thank you Pam! My husband likes these kind of meals too, and honestly I was getting a little tired of chicken! 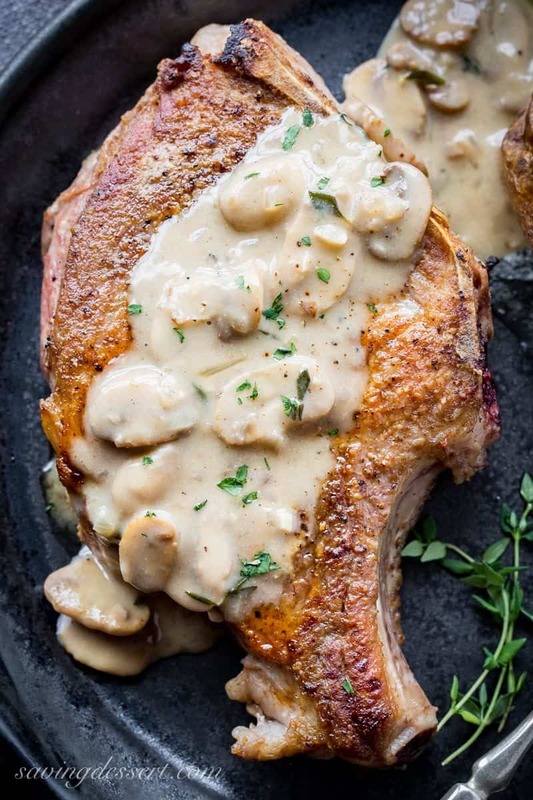 I love pork chops with mushrooms sauce and your recipe is perfect. You are such a great cook Tricia. Thank you Gerlinde. This is hearty stuff – so delicious with the gravy. Have a wonderful week and thanks again. SO much I love about this dish! I have bone in chops in the freezer so this may have to happen in my house very soon. Pork + mushrooms + thyme is a combo made in heaven. We’re definitely in need of some comfort food this week—back to sub-zero wind chills in the morning. Thanks so much Liz – enjoy! Why in the world don’t I make pork chops more often? These look wonderful and that mushroom sauce looks so rich and delicious Tricia! Thanks Chris! Hope you had a lovely weekend. WOW – this looks delicious. Oh man, all I can say is yummmmmm…I’m socked with the flu and wishing someone would make these for me, that sauce is a killer! 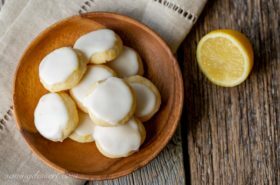 I wish I could make them for you. Hope you are feeling better soon. What a perfect way to enjoy pork chops! And that sauce looks perfect (and I always need a great sauce with my meat :). Beautiful! This is just my kind of cooking! Love mushrooms and pork (and wine!) together so I know I’d love this. Thanks – I hope you get the chance to give it a try! This looks/sounds utterly crave-worthy. Mushrooms are my winter saving grace–earthy and cozy, they make me feel grounded and happy. This looks like the perfect grey january pick me up! You are a star chef, Tricia. These pork chops look so succulent and that pan sauce unbelievably creamy and delicious!